From 25 - 27 August 2017 Tyger Valley presents you with a glorious spread of all things bridal! Bring the entire family and get that wedding to-do list ticked off. Be prepared to be dazzled out of your wits with wedding inspiration, which includes some of the following exhibitors: gowns and suits, footwear and accessories, hair and make-up, décor, stationary and much more! Make your wedding day as easy and stress free as possible with the help of Tyger Valley Centre! Stand a chance to win prizes to the value of R 130 000 from Rene H Couture, Moments2Media, Eventworx and Sterns Jewellers. Enter in Centre. Terms and Conditions apply. Say "I do" to Tyger Valley’s Bridal Experience this August. Visit www.tygervalley.co.za or join the Tyger Valley Facebook fan page! Enter in centre at the show. Terms and conditions apply. 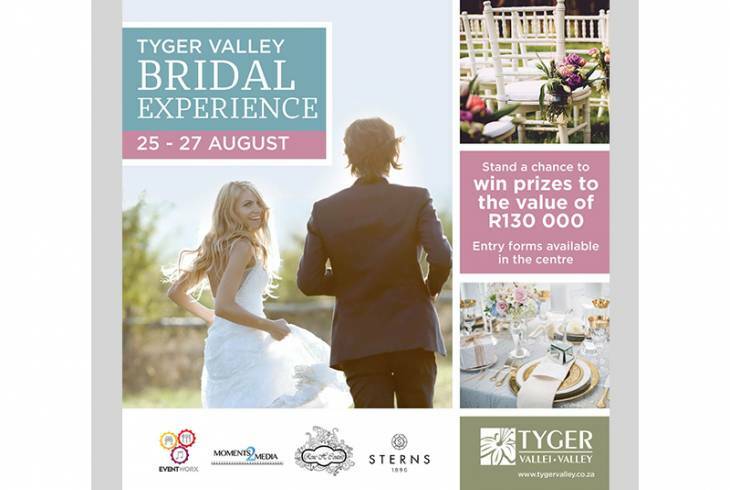 Tyger Valley Bridal Experience Information and Nearby Accommodation.